Redken Extreme Strength Builder Reviews | Does Redken Work? Many people love to experiment with their hair because it's an aspect of our body that's easily malleable. Losing fat and developing muscle takes a lot of time, energy and work, but simply altering one's hair style can be quick and offer a stark change in your appearance. Even the most complex and time intensive styles can be achieved in less than a day, but it's important to be cognizant of your hair's limits as well. Dying hair bright, fanciful colors can be exciting, offering you a refreshed look and glow of self-confidence, but many hair dyes feature harsh chemicals which strip the hair of its natural oils while also weakening the integrity of the hair shaft. Bleaching hair before using a color dye will especially cause damage, and if you don't hydrate your hair properly, you can very quickly end up with a limp, dry husk of what your locks used to be. To combat the effects of chemicals and heated tools, there are a variety of deep conditioners and serums on the market that claim to restore one's hair back to its original beauty and health. Does Redken Extreme Strength Builder Plus Work to Treat Damaged Hair? 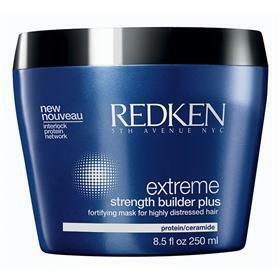 Redken Extreme Strength Builder Plus is one such product that was developed specifically for highly damaged hair. It boasts of a unique formula that utilizes a natural protein compound to adhere to the hair and restore its lost strength and vitality. A lot of products like this make heady promises, but it's best to not expect any miracles in the long run. Heavily damaged hair can benefit from the presence of oils and moisture, but it won't really reach its virgin state before processing. The bottom line is that while this formula works for some people, it doesn't work for everyone. It contains a high volume of lipids, which coat the hair and provide it with improved structure. This improvement isn't really ingrained within the hair, it's merely a surface coating that smooths the rough texture while filling in cracks and gaps. The result is hair that looks shinier and that feels more silken, but the reality is that the hair isn't truly repaired at all. It's not quite possible to revert severely damaged hair back to its original state. The only part of the hair that's alive is the root of the follicle, the hair that you style isn't going to truly change in a positive way until it grows out. So Redken Extreme can improve the appearance of your hair, but it will not improve your hair's overall health. Some customers have also cited that the product is too heavy on their hair, weighing it down and making it feel greasy and unkempt. If your hair is only mildly damaged, then this treatment will likely be too intense and viscous, especially on thin hair. If you'd like to give a Redken product a test run, you can find it at major beauty supply stores like Ulta, as well as from online retailers such as Amazon.com. To get updated information on even more products for damaged hair, click here.